The sound insulation performance of some ceiling systems is dependent upon the attachment of a Resilient Bar to the underside of the joists and perimeter noggins on all four sides of a room. The Resilient Bar is fixed at right angles to the joists at 450mm maximum centres for single or double applications. When 2400mm board is being used the Resilient Bar will need to reduce to 400mm centres. Bars are jointed by overlapping directly over joists with a minimum overlap of 200mm. Plasterboards are fixed with long edges at right angles to Resilient Bars at 230mm centres using Drywall self-tapping screws which should penetrate the Resilient Bar by a minimum of 10mm. The Resilient Bar is designed to offer improved acoustic insulation when constructing a conventional ceiling under timber joists. Mineral wool insulation can be included in the floor cavity to improve acoustic performance. To ensure maximum sound insulation performance, screws fixing the plasterboard must not be in contact with the joists. 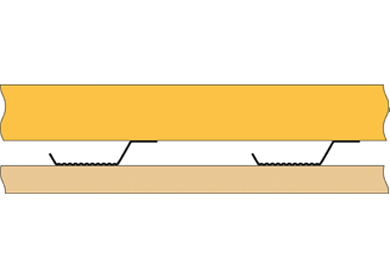 When installing a dual layer of boards, all joints in the second layer must be staggered in relation to those of the first layer.